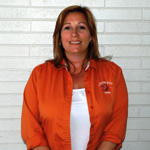 Lemon Bay High School is home to an array of teachers, one of them being Becky Leclerc. Leclerc has not always lived in Florida. She is originally from Maine. Leclerc was born and raised in Norway, Maine. After graduating high school she attended Hesser College located in Manchester, New Hampshire, and then New Hampshire College, also in Manchester. After finishing her education in New Hampshire, Leclerc moved to Florida to be closer to her family. While here she attended Manatee Community College in Venice. All in all, Leclerc earned an associates degree in business administration and a bachelor degree in business education. Leclerc is certified to teach business and/or math. Leclerc started off as a substitute teacher for six months at L.A. Ainger. Then she decided to start teaching at Lemon Bay. Leclerc has been teaching at Lemon Bay for a total of five and a half years. During this time she has been teaching algebra and geometry. Leclerc also co-sponsors the Junior Class. She helps organize a variety of events at the school throughout the year such as prom, Mrs. Lemon Bay, and the junior class lip sync. While Leclerc is heavily involved in Lemon Bay, she still finds plenty of time outside of school to have a little bit of fun. Leclerc has four beautiful daughters, one of whom attends Lemon Bay. Leclerc enjoys golfing, jet skiing, boating, going to the beach, attending her daughter's volleyball games, and shopping with her friends. When school is out of session, Leclerc loves nothing more than to visit Maine. "I love going up there to see my mom, dad, and brothers. It is such a beautiful place and extremely relaxing." Leclerc is actively involved in school all throughout the year and still finds time to enjoy her little spare time.